Jason Richwine, PhD, is a public policy analyst based in Washington, D.C., and a contributing writer at National Review. While the percentage of immigrants who arrive with a college or advanced degree has risen over the past decade, the extent to which foreign education translates into useful skills here in the United States is an open question. 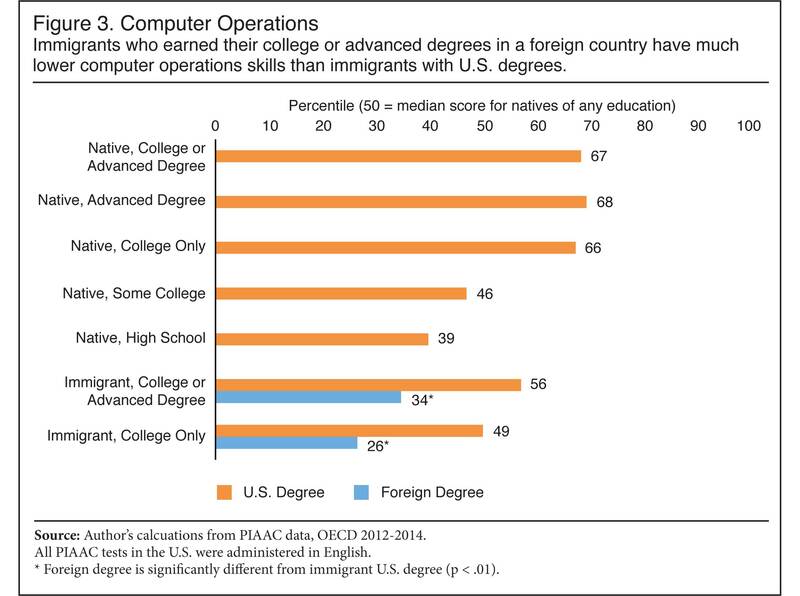 Based on English-language tests of literacy, numeracy, and computer operations administered by the Program for International Assessment of Adult Competencies (PIAAC), this report finds that, among test-takers with at least a college education, U.S.-degree holders out-score foreign-educated immigrants by a wide margin. For example, among those with at least a college degree, native-born Americans score at the 74th percentile on literacy, while U.S.-educated immigrants score at the 66th percentile, and foreign-educated immigrants score at just the 42nd percentile. Policy-makers should therefore be cautious in treating foreign degrees as evidence of "high-skill" immigration. Among immigrants in the United States whose highest degree is either a bachelor's ("college") or a master's or Ph.D. ("advanced"), about 40 percent received their highest degree in a foreign country — meaning they are "foreign-educated". 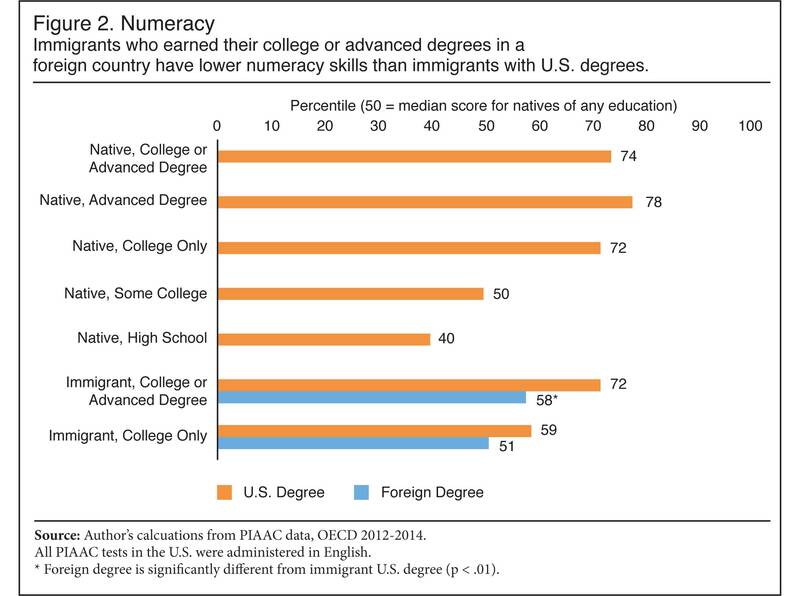 On numeracy, foreign-educated immigrants with a college or advanced degree perform closer to the level of natives who have some college education, but not a bachelor's. Despite their reputation for specializing in STEM fields, about one in six foreign-degree holders score "below basic" in numeracy. View the entire panel video. Furthermore, a July report from the Center quantified "occupational mismatch" among highly educated legal immigrants, finding that 20 percent of legal immigrants with a college degree have a low-skill occupation, vs. just 7 percent of natives with the same paper credential.3 That report suggested various reasons why highly educated immigrants have less success than natives in the U.S. labor market. For example, immigrants may be unfamiliar with regulations, networking, and licensing requirements, while others may arrive on temporary visas that restrict their job options. Another possibility, however, is that highly educated immigrants are simply less skilled than their native counterparts, especially when it comes to performing tasks that require English ability. If so, the rise in "skilled" immigration, as measured by educational attainment, may be overstated. This report finds that foreign-educated immigrants perform substantially worse than U.S. degree holders on English-language tests of literacy, numeracy, and computer operations. The gaps are in some cases so large that natives with only a high school diploma out-score immigrants with a foreign college degree. The Program for the International Assessment of Adult Competencies (PIAAC) administers tests of literacy, numeracy, and computer operations in OECD nations. Taken by over 8,000 Americans between the ages of 16 and 74, the PIAAC measures the skills of a representative sample of adults living in U.S. households between 2012 and 2014.4 The tests are strictly in English, meaning people whose English is weak will likely perform poorly. The background questionnaire, however, is available in both English and Spanish to ensure wide participation. Skill Definitions. Conceptually, literacy is not merely the ability to read sentences. PIAAC's definition of literacy is "understanding, evaluating, using, and engaging with written text to participate in society, to achieve one's goals, and to develop one's knowledge and potential. "5 By this definition, even native English speakers receive low scores on the test when their literacy skills are not well developed. PIAAC defines numeracy as "the ability to access, use, interpret, and communicate mathematical information and ideas, [and] to engage in and manage mathematical demands of a range of situations in adult life." The PIAAC does not cover algebra or calculus or any other kind of advanced math. Instead, test items are based on challenges that might be encountered in ordinary life, from basic arithmetic to drawing inferences from a chart.6 Though these tasks may seem straightforward, scores on the numeracy test vary widely even among educated U.S. natives. Computer operations is a specialized test based at least as much on adeptness with technology as it is on reasoning ability. PIAAC calls it "problem-solving in technology-rich environments" that involves "using digital technology, communication tools, and networks to acquire and evaluate information, communicate with others, and perform practical tasks." Put more concretely, test items require participants to perform computer-based tasks similar to what an executive assistant might do in a busy office.7 Though less fundamental than literacy and numeracy, computer operations is an important test for immigrants with foreign degrees, as the skills they brought from their home countries will be less useful if they cannot utilize technology common in U.S. workplaces. Importantly, respondents needed to have a minimal level of computer experience in order to take the computer operations test. (By contrast, paper-and-pencil versions of the literacy and numeracy tests are available for the computer illiterate.) This exclusion raises interpretive issues that are explored in the results section. Foreign Educated. Following MPI, this report defines foreign-degree holders as immigrants who arrived in the United States either in the same year or after the year they completed their education. By implication, whether immigrants are "foreign-educated" depends only on their highest degree. If an immigrant receives a bachelor's degree in a foreign nation but then receives a master's in the United States, that immigrant counts as U.S.-educated. Data Presentation. A perennial problem with average test scores is that they have little meaning without reference to the full score distribution. To illustrate, scores on each PIAAC test range from zero to 500, but how much better is a score of, say, 300 compared to a score of 200? The answer depends on how spread out the score distribution is. If scores tend to bunch up in the center, then jumping 100 points could be a substantial improvement relative to other test-takers. By contrast, if scores are widely distributed, then the relative improvement from a 100-point jump would be much smaller. To make score differences interpretable, the main results of this report are presented as percentile scores that mark the place where the average immigrant lies on the distribution of U.S.-born test-takers. For example, if an immigrant group scores at the 30th percentile, the average immigrant in that group would score better than 30 percent (and worse than 70 percent) of natives. Raw scores and other statistics are provided in the appendix. Another outcome of interest is the proportion in each group who score "below basic".9 In the literacy context, this could mean someone who is functionally illiterate. Tasks such as reading multiple pages, sifting through competing information in a chart, and making even low-level inferences are challenging for people in this group. Similarly, a person with below basic numeracy skills struggles when required to do more than simple counting, sorting, and arithmetic. In computer operations, someone who is below basic may have some familiarity with computers, but would struggle beyond rote tasks. Sample Limitations. Researchers love to run detailed cross-tabulations with their data, but sample sizes are often a limiting factor. In the case of the PIAAC, the dataset contains test results for over 1,000 immigrants in the United States, but the number of immigrants with college or advanced degrees is considerably lower — especially when U.S. degrees vs. foreign degrees are compared. Table 1 gives the relevant sample sizes. Because of the sample limitations, this report focuses on the difference between foreign and U.S. degrees without involving other interesting variables such as age, gender, and national origin. Those analyses will have to wait for a larger dataset. Please note the lower number of computer operations test-takers is due to the need for past computer experience, as mentioned above. Also note that although the sample sizes of immigrants with college as their highest degree are low, their presence is necessary to show that a greater proportion of U.S. degree holders having education beyond college is not the only reason for their superior test performance compared to their foreign-educated counterparts. The number of immigrants with advanced degrees is too small to analyze separately from immigrants with college degrees. This section first presents the PIAAC percentile scores for each immigrant-education group, then analyzes the fraction of each group who score "below basic". It concludes by exploring the degree to which insufficient exposure to English depresses the scores of foreign-educated immigrants. Percentiles. Figures 1, 2, and 3 show the percentile scores on the literacy, numeracy, and computer operations tests, respectively. Natives out-score comparably educated immigrants on all three tests. Significant differences within the immigrant category exist, however, as immigrants with foreign degrees lag well behind immigrants with U.S. degrees. (The only non-significant difference occurs with college-only immigrants on the numeracy test.) On literacy, for example, immigrants with foreign college or advanced degrees score at just the 42nd percentile of the U.S.-born distribution, compared to the 66th percentile for immigrants with U.S. college or advanced degrees, and the 74th percentile for comparably educated natives. The performance by foreign college and advanced degree holders on both the literacy and computer operations tests is so poor that they are more comparable in skill to natives with only a high school diploma. On the numeracy test, which is perhaps the least English-intensive, foreign degree holders are more comparable to natives with some college. Below Basic. Instead of average scores, Table 2 focuses on the bottom end of the distribution, showing the percentages who score below basic on each test. 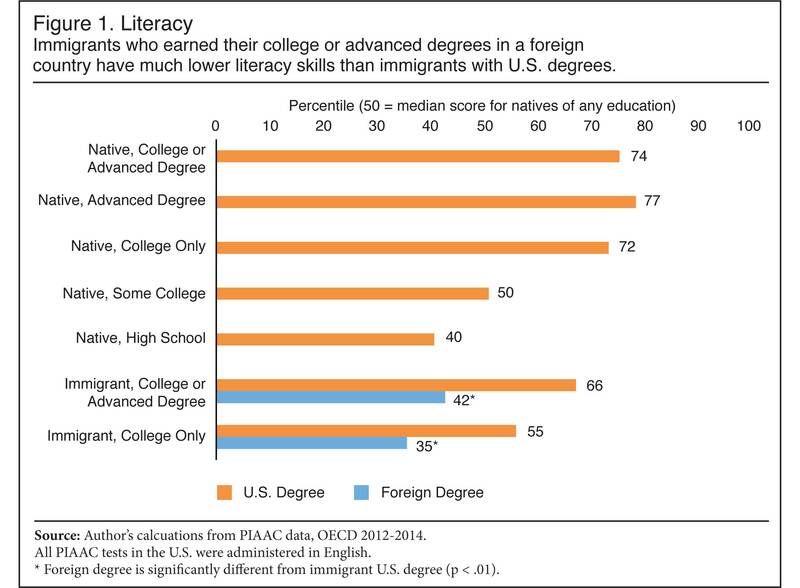 The literacy and numeracy results are in line with Figures 1 and 2, as immigrants with foreign college or advanced degrees are the most likely to be below basic, followed by immigrants with U.S. degrees, and then by natives of comparable education. 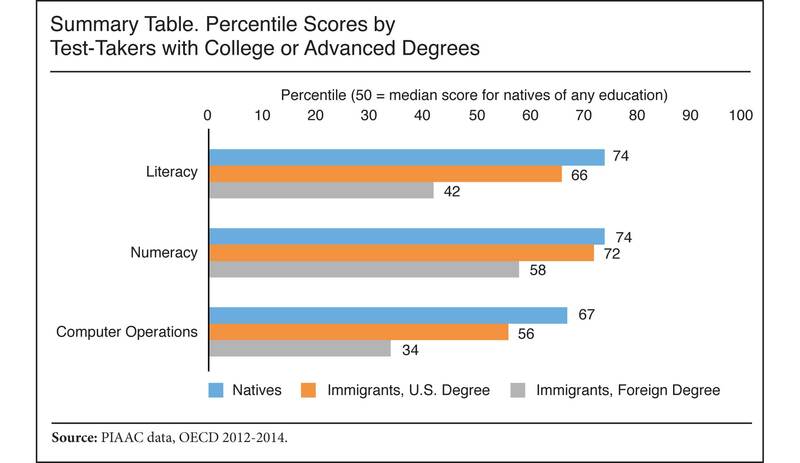 Foreign-educated immigrants are again most similar to natives with only a high school diploma on literacy, and most similar to natives with some college on numeracy. English Exposure. As noted earlier, all of the PIAAC tests in the United States were administered in English. PIAAC's English-only approach to testing is convenient for this report, since a good command of English is essential for most high-skill jobs in the United States. But perhaps high-skill immigrants with foreign degrees simply need some exposure to English here in the United States before they can perform well on the PIAAC tests. Unfortunately, as Table 3 indicates, even among immigrants who arrived in the United States more than five years before taking the test, the skill gap between U.S. and foreign-degree holders is still present. If anything, it is larger. Although sample size limitations preclude a more in-depth exploration of the language issue, it is clear that insufficient exposure to English is not the only reason that immigrants with foreign degrees perform worse than their U.S.-educated counterparts on the PIAAC tests. Though just speculation, it is possible that standards for college and advanced degrees are lower in many of the countries that send immigrants to the United States. Although skilled immigration may be desirable, policy-makers must be cautious in using foreign degrees as proof of those skills. This report has shown that immigrants with foreign degrees perform substantially worse than U.S. degree holders on tests of literacy, numeracy, and computer operations. In some cases, the gaps are so large that immigrants with foreign college degrees have skills that resemble those of natives who have only a high school diploma. Although poor English clearly plays a role in the disparity — and a command of English is essential for success in most high-skill occupations in the United States — the disparity persists even among immigrants who have had at least five years to learn English after arriving. In Congress, some proposed immigration reforms acknowledge the greater value of U.S. degrees. For example, the RAISE Act would establish a points system for high-skill immigrants that prioritizes U.S. degrees over foreign degrees. It would also go beyond educational credentials by giving extra points for English fluency, STEM specialties, and pre-arranged employment. Ultimately, policy-makers should consider making skill selection even more direct. Universities, the foreign service, and the military have been using standardized testing for decades to evaluate applicants. For example, people who want to do advanced study in important subjects such as biology, chemistry, and physics need to take the Graduate Record Exam (GRE) to demonstrate their knowledge and preparation. Perhaps Congress could integrate similar tests into a truly high-skill immigration system. Appendix Tables A1, A2, and A3 provide means, standard errors, and standard deviations to accompany the percentiles shown in Figures 1, 2, and 3, respectively. The d column is a standardized measure of how much the scores of a given immigrant-education group differ from the scores of all natives. Specifically, it is the difference in mean scores divided by the native standard deviation (not by a pooled standard deviation). This measure of effect size is sometimes referred to as Glass's delta, and it is useful when the population standard deviations of the two groups appear to be substantially different. With a standard normal (bell-shaped) distribution, there is a direct link between percentiles and score differences expressed as d. For example, scoring 0.2 standard deviations above the mean (d = 0.2) has the effect of moving from the 50th percentile to the 58th percentile, while a score of one standard deviation above the mean moves a person to the 84th percentile. Because the distribution of PIAAC scores is not perfectly bell-shaped, however, the percentiles listed in Figures 1, 2, and 3 are typically one to two percentile points different from what the d's would imply in a standard normal distribution. 1 Steven A. Camarota and Karen Zeigler, "Better Educated, but Not Better Off", Center for Immigration Studies Backgrounder, April 17, 2018. 3 Jason Richwine, "High-Skill Immigrants in Low-Skill Jobs", Center for Immigration Studies Backgrounder, July 12, 2018. 4 Bobby D. Rampey, Robert Finnegan, Madeline Goodman, Leyla Mohadjer, Tom Krenzke, Jacquie Hogan, Stephen Provasnik, and Holly Xie, "Skills of U.S. Unemployed, Young, and Older Adults in Sharper Focus: Results From the Program for the International Assessment of Adult Competencies (PIAAC) 2012/2014", National Center for Education Statistics, March 2016, p. C-2. 6 Ibid., p. 2, p. B-8. 7 Ibid., p. 2, p. B-11. 8 Jeanne Batalova and Michael Fix, "Through an Immigrant Lens: PIAAC Assessment of the Competencies of Adults in the United States", Migration Policy Institute, February 2015. This CIS report follows Batalova and Fix by defining a foreign degree holder as any immigrant who arrived in the United States either in the same year or after the year they completed their education. One difference, however, is that CIS drops cases with illogical arrival and completion years. Specifically, when comparing immigrants with foreign vs. U.S. degrees, this report drops anyone claiming to have finished a college degree before the age of 20, as well as anyone claiming to have finished school at an age higher than their current age. Surprisingly, although fewer than 20 out of approximately 350 immigrants with otherwise valid responses were dropped, the result was a substantial narrowing of the score gap between foreign and U.S. degree holders. Without dropping these cases, the differences would be even larger. Another difference is that Batalova and Fix omit results on computer operations, arguing that the sample size is too small and unrepresentative. As noted in the main text, the computer operations test could be taken only on the computer, so respondents who were routed to paper-and-pencil on the literacy and numeracy tests had to skip it. The smaller sample sizes encountered by Batalova and Fix are mitigated somewhat by a supplemental administration of the PIAAC tests in 2014. This report includes both the original 2012 and later 2014 data, but the 2014 data were not available to Batalova and Fix when they prepared their report. Furthermore, test-takers who needed to use paper and pencil would likely have performed poorly on computer operations. The "adjusted computer operations" column in Table 2 takes this into account. 9 PIAAC offers no simple labels for the five skill levels it identifies. This report's use of the label "below basic" for the lowest level follows from Batalova and Fix's nomenclature. They describe Level 3 and up as "proficient", Level 2 as "basic", and below Level 2 as "low". 10 In the 2017 American Community Survey, about 37.5 percent of college-educated immigrants (ages 25 to 64) have Science, Technology, Engineering, or Mathematics (STEM) degrees, compared to 19.4 percent of natives.